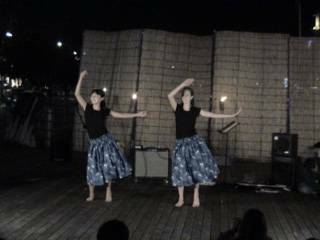 The team from Hawaii had a great time at Expo Ocean Park in Nago. The team has been such a blessing to the Island of Okinawa. To see Pastor Tim Newman and Pastor Travis leave with the team will be a real bummer, but we know that they have allot of ministry in store for them, when they arrive in Mainland Japan. Remember to keep these guys in your prayers, the greatest gift we can give the team is to continually lift them up before the throne of God. Again, we just want to say that we love you guys and thank you for ministering with us in the Ryukyu Islands. This is such a beautiful sight in Okinawa. I love bringing people over here when they visit the Island. We brought the Hawaii team to see this wonderful sight. 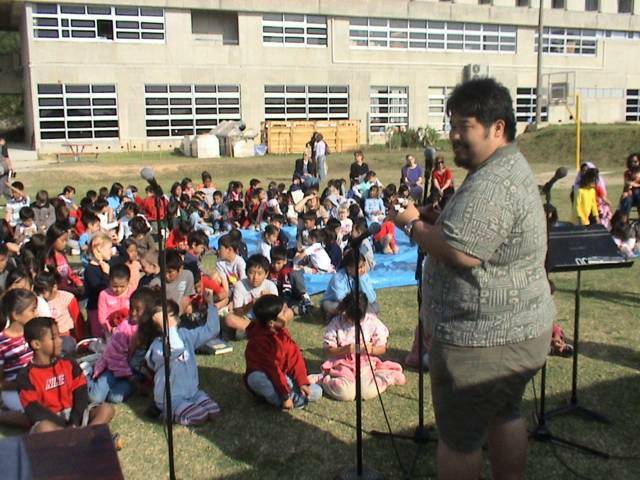 Monday morning the team from Hawaii did a "Hula" assembly at Okinawa Christian School International (OCSI). 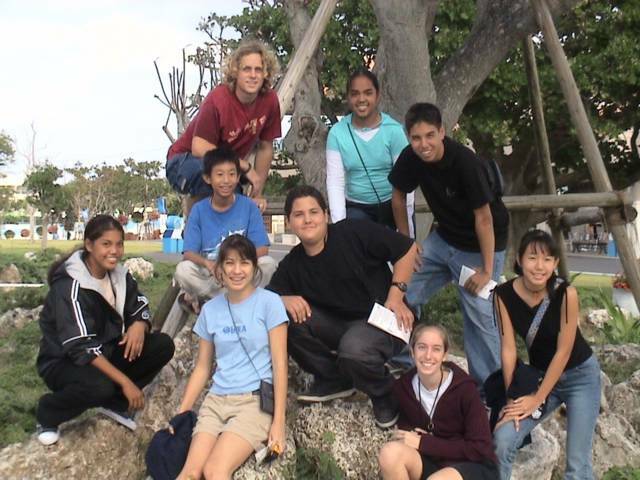 We had 2 assemblies that morning, one for the Elementary students and one for the Middle and High School students. It was a blast, we sang, gave testamonies, played the Ukelele, and danced for the students. 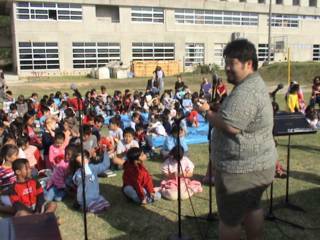 Pastor Travis from CCTokorozawa did a great job of making sure the kids were always entertained and ministered to. We want to again thank the team from Hawaii for coming over to Okinawa and ministering to all of us. Rosie is such a blessing to us all, and it is great to know and hear that the Lord is using her in such a mighty way. For those of you who do not know Rosie, she is the one on the left with the hat. 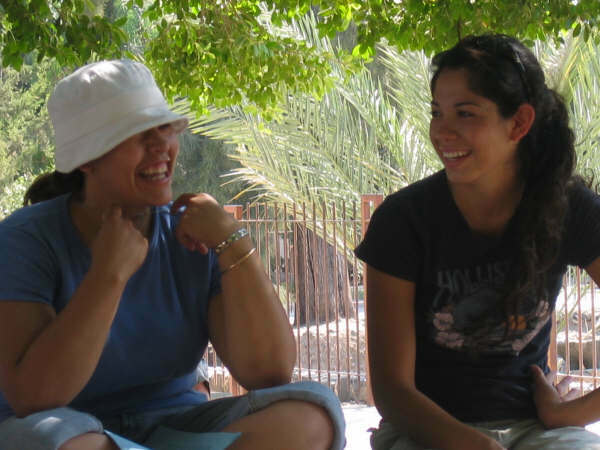 She emailed me the other day to tell us that she was ministering in Tel Aviv to a group of Mexicans. Can you believe it, Mexican Americans living in Tel Aviv. She stated that as she shared the Gospel with them, there were allot of seeds that were planted. So keep her in your prayers as you remember her in Israel. Remember Rosie, we love you and are blessed that you are serving the Lord, right where He has called you to be. Love, all of us in the USA and Okinawa Japan. Sunday morning the team from Hawaii shared a few songs with us before Pastor Tim Newman (CCWindward Hawaii) shared in the morning message. We began the services like usual, with a time of worship and then announcements. Before Pastor Tim came up, Pastor Rick introduced the team members and then they shared with us for a short time. It is such a blessing to see the giftings that God has given us in the body of Christ. The team from Hawaii has such a servants heart. Both services were a blessing, and the body was truly edifed this morning. We had a wonderful outreach night in Mihama on Saturday night. The team arrived late Friday night and were ready the next day to share Jesus love with the Okinawan and American servicemen. 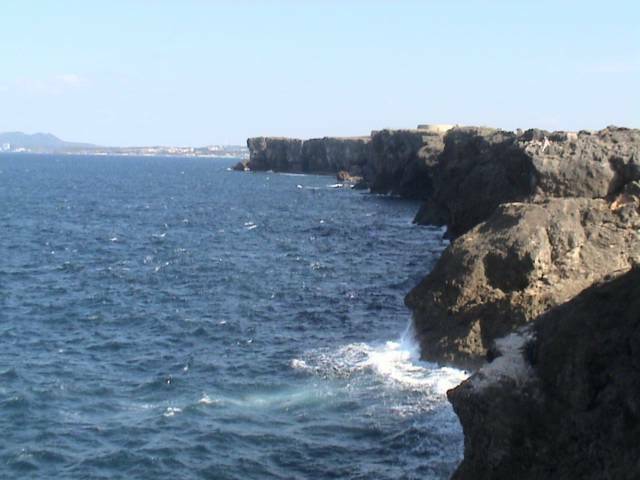 For those of you who have never been to Mihama in Okinawa. It is an open area shopping mall something you would see in San Diego near the boardwalk. Many people come out on the weekend to shop and just "hang out". So it is a great area to just share Jesus with people. We had a little hick ups as the night started. We set up our whole stage area and then the person who owned the store next to the boardwalk, asked us to take down the canopies that we set up. So we did, and the Lord continued to bless the night. We shared in Christian Hula, some Ukulele playing (Hawaiian Guitar) and testamonies of the Lord's love, it was a great time. The team is now here in Okinawa. They arrived last night a little tired as expected, but they are a blessing. We have a busy schedule now that they are here. 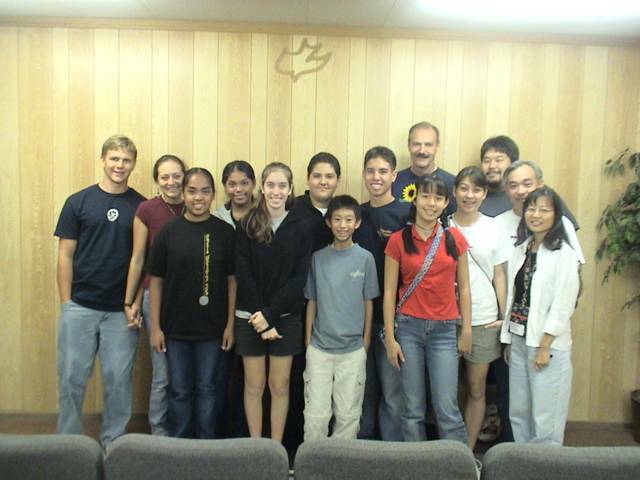 Their day began by serving at CCOkinawa cleaning and vacuuming the offices and sanctuary. Tonight the Mihama outreach will begin. 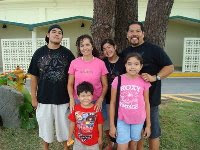 Sunday they will be ministering in both services followed by a Hawaiian type Luau at night. Monday they will be ministering at OCSI (Okinawa Christian School International), Tuesday will be a free day and Wednesday they will head to Tokorozawa to do an outreach in Mainland Japan for 1 whole week. Please keep the team in your prayers as they serve Jesus on the Island, we are expecting great things from God as the team is here. Hello everyone! This is Travis and his wife Dawn. 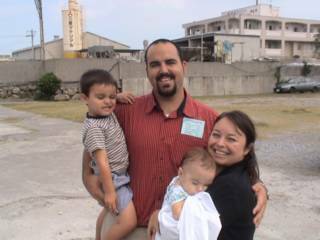 Travis is the Senior Pastor of CCTokorozawa in Mainland Japan. They are here visiting for a few days while the team from Hawaii comes and ministers here for a Hula outreach. The Takamiya's have been planting the church in Mainland for 2 years and are still excited about the work God is doing in Japan. Please continue to pray for them as they faithfully serve Jesus Christ. 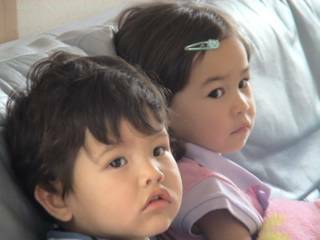 They have 2 wonderful children Erika 3 and Evan who is 10 months old. 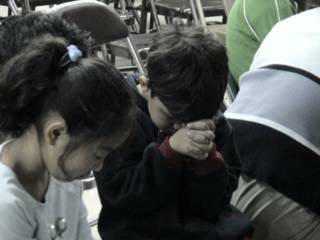 Specific prayer needs are : God's hand in the work in Tokorozawa, key leadership as they are being raised up, and that, they will continue to hear the voice of God specifically as they are being led by His Spirit. 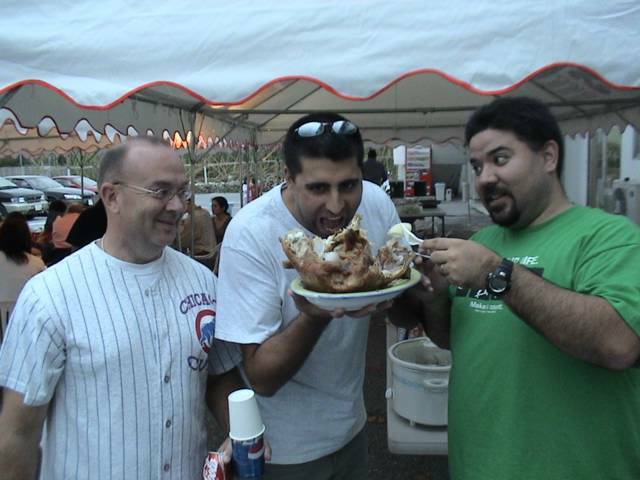 The day after Thanksgiving is a great time in Okinawa. Everyone in the body brings down their leftovers to the church and we cook up a couple more turkeys and feast out. As you can see these guys are always ready for more turkey action. On the left, Keith Duggan (Duggie) knows there is another turkey in the kitchen so he is not too happy about the bones, but Trevor Raichura (center) just wants to dig in. On the right is our own Pastor Rick and he is not about to let any of this get away from him. Well, we spend the rest of the night having a great time playing games and fellowshipping. Oh yeah, also, we eat allot of desserts. 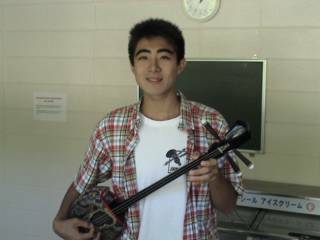 This is Keisuke and he plays the Okinawan Sanshin. It is a cross between a guitar and a banjo. Main Land Japan has one that is similar which is called the "shamisen". The shamisen in mainland is made out of cat skin .... meowwwww! The Okinawan Sanshin is made from Habu Snake skin, quite different but the same. Keisuke is gifted in playing and we are blessed that he will be with the team in Mainland. So please keep the team in prayer as we prepare to journey to the USA. Many of the team members have never been to California, so we are looking forward to introducing Cali Culture to them. We love you all! It started off as a Women's Retreat but the hotel had to cancel because of internal problems. So the girls did not give up and the switched it to a Women's Conference at the church. It was incredible to see the church transformed from a Sanctuary to a living room The theme of the Conference was "My heart, Christ's home" so they had different living rooms in the sanctuary. They had American and Japanese style living rooms set up. So in the Sanctuary, they could sit on sofas or on the chairs. The atmosphere was relaxing. Too bad we could not keep it that way for Sunday morning services. Different ladies in the church spoke messages and taught workshops. It is a blessing to see the gifting of the Lord in action in these ladies lives. 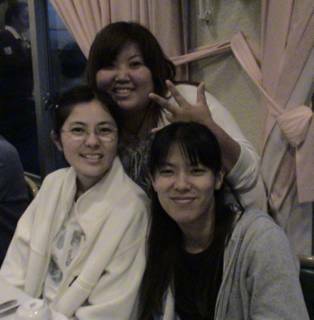 Well, they finished off the conference by meeting for a dinner on Saturday night at Awase Golf Course. They ate, had a teaching and finished the night on a wonderful note. 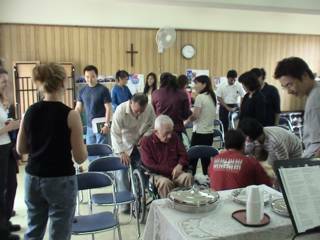 May the Lord continue to bless the ministry here at CCOkinawa. We are blessed here in Okinawa to have Chaplain Dennis Wheeler in Okinawa. 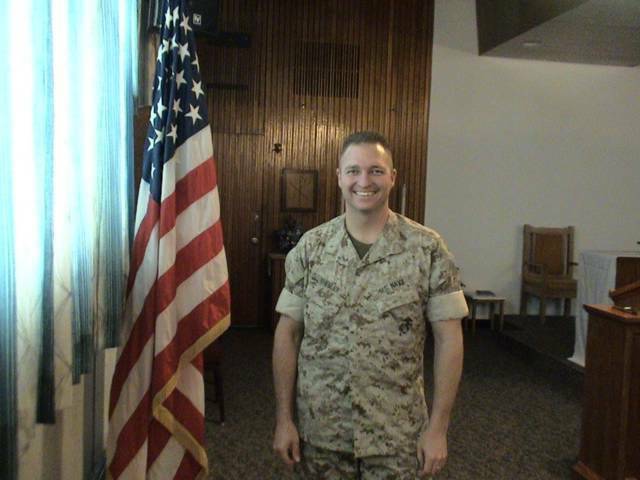 He has served the Marine Corps for some time now and is finishing up his tour of Duty on the Ryukyu Island. Chaplain Wheeler is originally out of Chuck Smith Jr.'s Church at Capo Beach Calvary, where his church family is proud and blessed by his service in the Marine Corps. His wife Patti is also a blessing to us, as she is involved in College study and serving along side her husband in the ministry. Thank God for our better halfs, what would we do with out them. 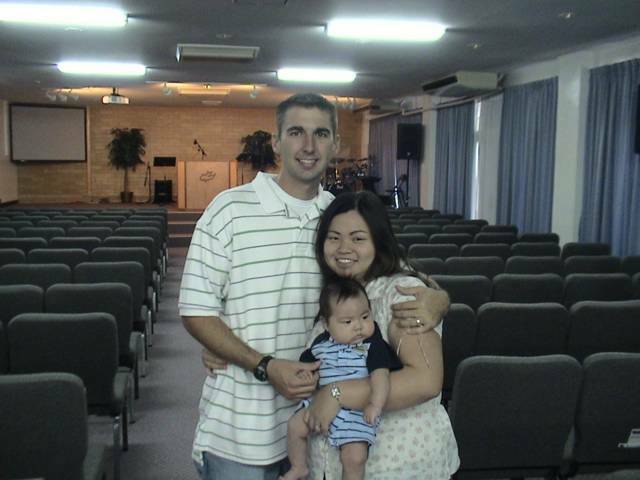 Please continue to pray for Chaplain Wheeler and Patti as they faithfully serve the Lord here in Okinawa Japan. Every Tuesday morning we gather for prayer at the school that I serve as Chaplain. We gather before school for a time of worship and prayer. The teachers and students gather in the morning for this special time. Wonderful things are happening at the school and our prayer times are a part of it. So continue to pray for the faculty, students, office workers, and maintenance crew at the school. We believe that God will continually work in this place. We are truly blessed. 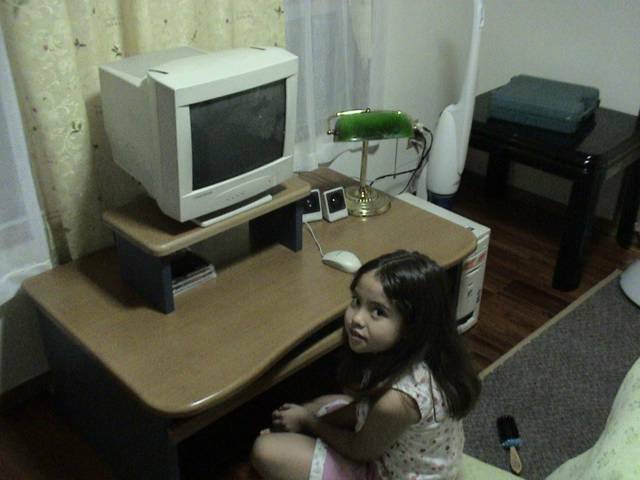 Yesterday someone from the body here at CCOkinawa asked me if we needed a computer. I told them yes, what they did not know is that Joanna and I were praying for one just the other day. So they brought it to us that Sunday afternoon. God answered our prayer so fast. Praise the Lord He is so good. Well that is just half the story. Today is Veteran's day in Okinawa. Most of the servicemen have the day off. The ladies gathered at the church for a women's Biblestudy, so when they left some of the guys took off for a lunch at the all-you-can-eat KingKong Yakiniku. You heard it right, an all-you-can eat. These are the favorite words of Glenn, Pastor Rick and myself. At this place you cook your own steak, chicken or pork. The side dishes are fresh vegtables, fried rice, soups, etc, etc, etc. So as you can see we are 6 happy dudes. Sitting on the Tatami mats is cool, but sometimes uncomfortable if your legs fall asleep easily. But other than that, it is a real comfy way to relax over a lunch or dinner. These are the guys who were at the luncheon starting from your lower left and going around the table. 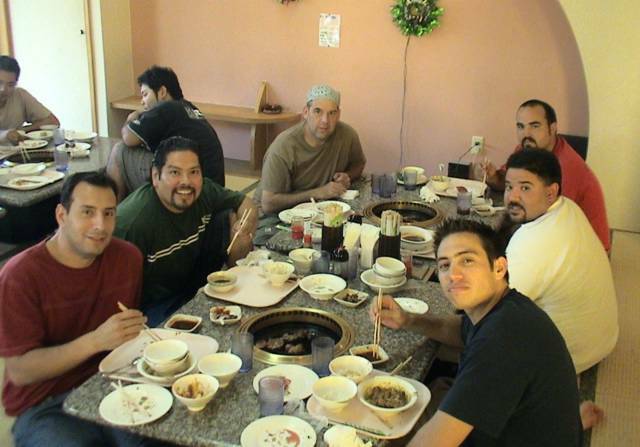 Captain Ernest Herrera a pilot in the Air Force, myself humble servant of the Lord, Mike Plemmons retired Marine, Glenn Phipps sumo in training, Rick Barnett most anointed Pastor, and Damian Velarde radiology specialist Lester Navy Hospital - youth leader at CCOkinawa. Brent and Cathy Mize are the proud parents of Baby Aaron. For many of you this is the first picture you have seen of thier new baby. You might remember that Cathy was one of the first missionaries we sent over to Okinawa. While she was here serving the Lord, God brought a wonderful man into her life, Brent. Brent Mize is in the Air force and has recently been promoted to Staff Sergent. It is a blessing to see God work in their life. They take every day one day at a time and know that God who began a good work in thier life will complete it until the day of Christ Jesus. Jesus is so good. 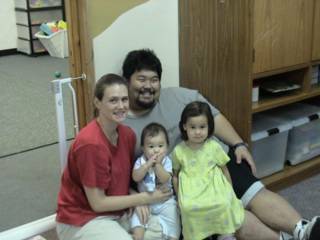 We are so blessed to have Glenn, Farah, Caleb and Jonah as missionarie here in Okinawa Japan. The Phipps have been such a blessing to the body here and we look forward to the work that God will continue to do in thier lives. 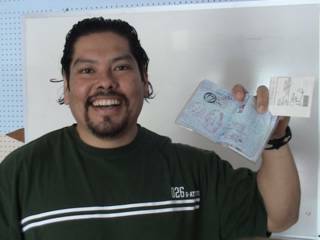 Glenn wants to say hi to all of his family in California and that he is looking forward to seeing them soon. Farah and the kids will be leaving on Nov. 16th to spend time with friends and family. 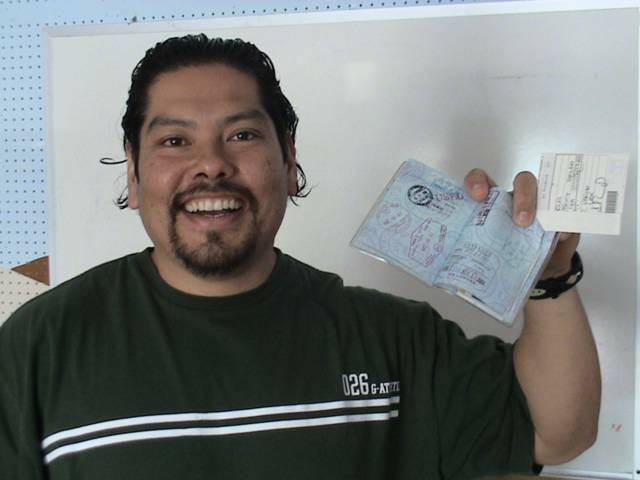 Glenn will be visiting one week later and will stay there with his family until Dec. 14th. They are looking forward to spending Thanksgiving with loved ones in Cali. This is a direct quote from the Phippster himself "Jesus Christ loves you" Yes, Glenn is looking forward to telling you all this in person and the great work that is going on in Okinawa. Commited to Jesus is what her fellow missionaries say about her. As she serves Jesus every day here in Okinawa. Not only does Jessica serve here in CCOkinawa, but she also helps substitute at OCSI, whenever needed. 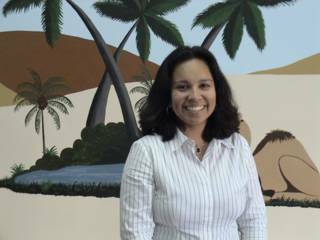 Jessica oversees the children's ministry here in CCOkinawa and also oversees the Women's Discipleship house. Continue to pray for her as she seeks God's guidance on a daily basis. Her goal is to represent Jesus Christ is all that she does. He lives like a true missionary. He does not know where his next meal will be, does not ask for much, but serves Jesus with all his heart. Just kidding about the meal stuff. Tim lives with Glenn and Farah and she makes sure that he eats well. If he is not there you can always find him at the Ruiz house fellowshipping with Tom and Zach. But in all sincerity Tim is one of a kind. 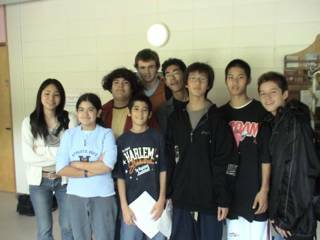 He has only been here in Okinawa a little over 2 years but he is fluent in Japanese writting, speaking and soon teaching. 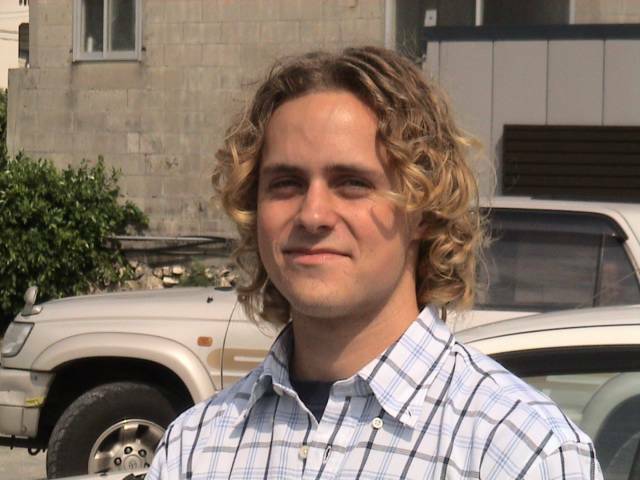 Tim will begin teaching at CCBC Okinawa in the language department, teaching new students Japanese conversation. God has gifted this man in so many ways. His daily routine consists of working at the church, heading out to Naha city where he teaches in a Japanese school, and leads worship at CCNaha for thier Wednesday afternoon service. Continue to pray for him as he asks God's guidance in all that he does. This past weekend we had the opportunity to head out to Cana Community Foursquare church and lead worship at Shawn Shavers church. You might remember Pastor Shawn he was the Chaplain at OCSI a few years ago. He has always been a blessing to us, and we asked him if we could come and be a blessing to his congregation. So we loaded up the van with one of the worship teams here at CCO and drove down to Kitanakagusuku and visited with the church. The people there in Cana are great. They made us feel welcome. Pastor Shawn teaches in english with a japanese interpreter, so we were able to understand the message. After the service we were invited to stay for lunch, but because of other responsibilites at the church back in Okinawa City we had to get back. But next time we told him that we will return with a children's ministry team and will make sure that we stay for lunch.